As you can probably tell, we’re pretty much obsessed with wildlife, birds, and butterflies at Genuine Kentucky. Truth be told, I’m becoming more than a little intrigued with insects as well -dragonflies, lady bugs, stick bugs, lightning bugs… such cool little guys. Even more reason to love living in Kentucky. We have such a beautiful variety of these fascinating animals. One of my favorite things to do when in the Land Between the Lakes area (in addition to eating catfish – another obsession) is to look for and observe wildlife. Whether we’re at the outstanding Woodland’s Nature Center, the equally outstanding Elk & Bison Prairie or hanging out at one of the beautiful state parks – my eyes are always peeled for extra-special locals. The hummingbirds shown above are just some of the beautiful birds who call The Nature Station “Heaven on Earth.” The oasis The Nature Station has provided for birds include their favorite plants, plenty of shelter, birdseed, hummingbird feeders, and even a bat house! When you’re in the Land Between the Lakes area, I hope you’ll take in all the beauty around you – including the amazing array of birds. 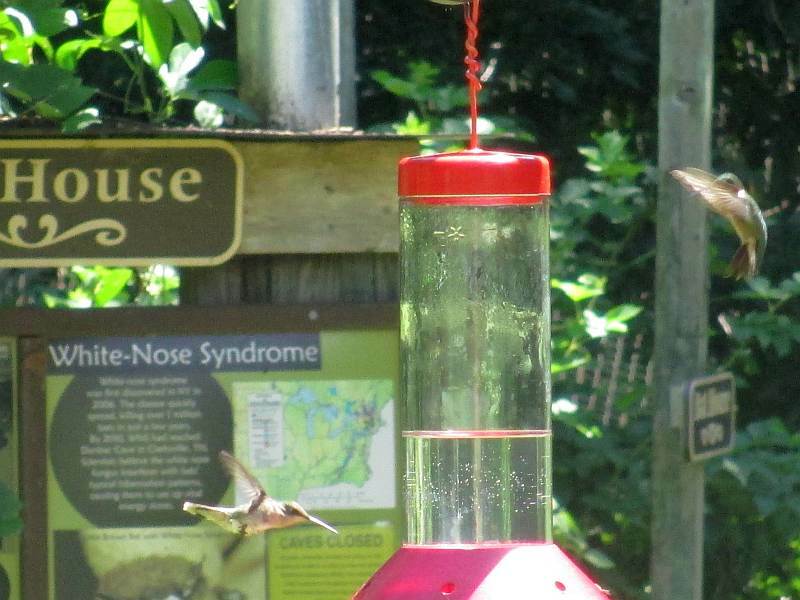 At many of the travel brochure stands in the area, you’ll find a pamphlet titled “LAND BETWEEN THE LAKES AREA BIRD CHECKLIST.” This extremely handy little guide lists the different birds you could potentially see while at Land Between the Lakes. If you’d like to print out your own guide, you can do that too! LBL.org has thought of everything and has an online version of the Land Between the Lakes Bird Checklist. One of Kentucky’s favorite daughters, Country superstar Patty Loveless, is publicly declaring war on a disease that has claimed two of her family members: COPD. Other celebrities declaring war on COPD are Bruce Jenner, Danica Patrick, Jim Belushi and Michael Strahan. Patty Loveless decided to be a spokesperson for the organization, mainly due to the fact that she tragically lost her sister to the disease in 1996. The Nashville legend and Grand Ole Opry star’s raising awareness for chronic obstructive pulmonary disease (COPD), which includes emphysema and chronic bronchitis. Over 12 million people in the Untied States, alone, have this disease. Experts believe that the number is actually about twice that – but many don’t recognize the symptoms. Which is, of course, where people like Patty Loveless come in – to educate us all. For more information on COPD, go to drive4copd.com and download the campaign song, ‘Drive,’ sung by Patty, herself, for free. She co-wrote the tune with her husband, Emory. You can also take the five-question screener and be automatically entered to win either a trip to this year’s CMA Awards or a NASCAR experience in February. Now how cool is that? Patty Loveless was born Patty Lee Ramey on January 4, 1957 in Pikeville, Kentucky. Patty was the 6th of 7 children. Although she was born in Pikeville, Patty’s family lived in a small town nearby named Butcher Holler where her father was a coal miner. In 1969, the family moved to the Louisville area, seeking treatment for Patty’s dad’s lung disease. Beautiful Patty Loveless first came onto country music’s radar in 1986 with her first (self-titled) album. Patty has recorded too many country and bluegrass songs to list, but suffice to say she remains one of the best loved artists of all time. This fact was apparent to us (us being my husband and myself) when we recently attended a Patty Loveless concert at the Grand Ole Opry in Nashville. The sold out Opry was filled with a special kind of love that flowed from the artist to each audience member and right back to the artist. It was a special evening and you could feel it in the air. Loveless is a distant cousin of Loretta Lynn and Crystal Gayle. She is married to Emory Gordy, Jr. (1989 – present), who is also her producer. On October 21st, 1992 Patty Loveless had throat surgery. For the next nine weeks, she could not speak or talk! On her 36th birthday, January 4th, 1993, Loveless re-entered her professional life by performing at the Grand Ole Opry. One of Patty’s crowning achievements was her popular album When Fallen Angels Fly. It won the Country Music Association’s Album of the Year award and gave her four Top 10 singles. Patty Loveless made an abrupt and bold move away from commercial, country/pop in 2001 with a heart-felt, true to form bluegrass album. Mountain Soul was released to numerous critical accolades but, unfortunately, didn’t get the radio support necessary to make albums fly off the shelves. Patty loved bluegrass as much as bluegrass loved Patty, so she stuck with the genre for a memorable Christmas album, Bluegrass & White Snow: A Mountain Christmas, in 2002. On Your Way Home, marked a return to more “radio friendly” country, was released in 2003 to critical acclaim. As of today, Patty has charted more than forty singles on the Billboard Hot Country Songs charts, including five Number Ones. She has recorded fourteen studio albums (this isn’t counting compilations) in the United States, four of which have been certified platinum, while two have been certified gold. Patty Loveless was inducted into the The Kentucky Music Hall of Fame on April 7, 2011. Talk about a VERY deserving honor! If you’ve been in business since 1951, you must be doing something right. In the case of Belew’s Dairy Bar in Aurora, Kentucky, they’re doing at least one thing deliciously right – burgers! My husband, Michael, and I stopped at Belew’s for lunch on a recent trip to Kentucky Lake. We had hamburgers and onion rings, but the burgers were so outstanding that we nearly forgot about the onion rings. The burgers are thin with the crunchy edges that drive burger lovers to absolute distraction. That’s where the flavor is, you know! Everything about Belew’s Dairy Bar is absolute perfection. The friendliness, the reasonable prices, the food, the wonderful ice cream and milkshakes… There’s nothing about Belew’s I don’t love madly. There are few things in the world that are quite as impressive as a uncommonly delicious hamburger. If you echo this mouth-watering sentiment, you MUST stop by Belew’s Dairy Bar on your next trip to Lake Barkley, Kentucky Lake, or anywhere in the Land Between the Lakes area. 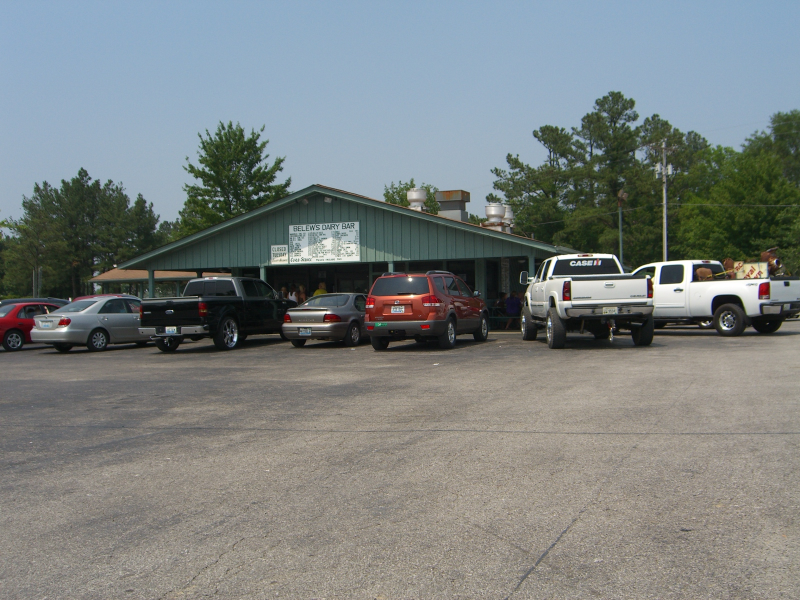 It’s located on US Highway 62 East, just a little past Aurora BBQ – Home of the Winking Pig (Outstanding BBQ!). I truthfully loved everything about Belew’s Dairy Bar and can’t wait to visit again and try their other sandwiches, sides, and dairy treats. It will be, however, hard not to order their hamburger though – sheer perfection. I also loved the “feel” of Belew’s – it’s a throwback to a simpler time: Carhops, milkshakes, Coke with crushed ice, and hamburgers so big and delicious you’re certain you’re in Burger Heaven. Seriously, it’s just the best place to go after a day on the lake. I’ll see you there – I’ll be the one with a melting ice cream cone in one hand and a half-eaten burger in the other.